September 10, 2011 -- That tiny crack on Louis Armstrong Court has opened a cavern of concern for the U. S. Open's producers, the U. S. Tennis Association. And the concern has covered the entire tennis world. With matches backed up from record downpours and record session cancellations at Flushing Meadow, and the glaring problem of fitting four matches on center court today, tournament officials relegated one women's semifinal to the Grandstand. It's seating capacity is 6,000 compared to the almost 23,000 inside the largest tennis venue ever built: Arthur Ashe Stadium. 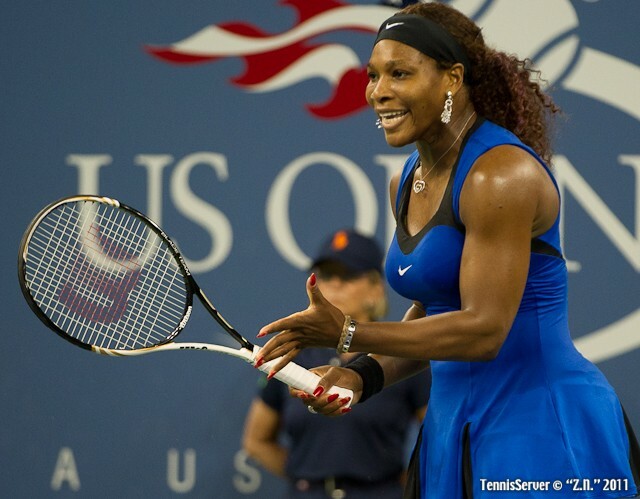 "Numerous factors needed to be considered for the rescheduling of the remaining four days of the 2011 U S Open," a statement from USTA said. "These factors included programming for US Open ticket holders, competitive fairness for players, and the existing television windows for the tournament." The USTA, in the same statement, knew its decision wasn't ideal. But can anything be ideal? A guarantee of three weeks of sunshine blazing down on the National Tennis Center is folly. And the governing body has operated irresponsibly from the moment it conceived plans for Ashe stadium. If architects had given developers a design that included a roof, seating capacity would have been cut. 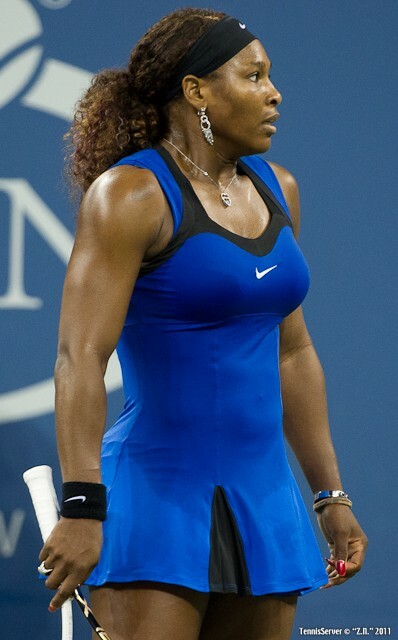 The USTA wanted big. Now, it has its biggest problem to date -- showcasing the best players of the game in the final stages of its premier money-maker, the single biggest revenue stream for its non-profit treasure chest. Pragmatic choices about size and long-term viability compared to the possibility of glitz, marketing genius, and annual record-breaking attendance wasn't a consideration pre-Ashe, though. 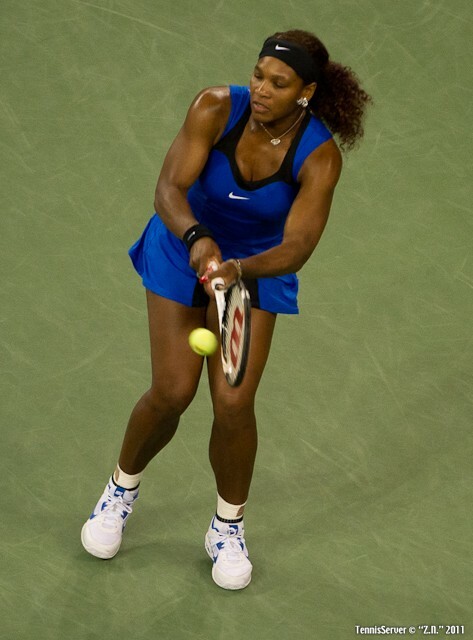 With its decision to put one semi out of television camera's view, the USTA officials also didn't "want to hold the two women's matches back-to-back on Ashe because if the men's matches ran long, the women in the second semi would have little recovery time before the final Sunday," the AP reported. The message, then, might be that the USTA has gotten, well, the message. Perhaps Super Saturday is a farce. And roofs could be necessary because in years past, the men had played semifinals on Saturday and the final the following day, putting the finalists in a position of rapid recovery, or else. 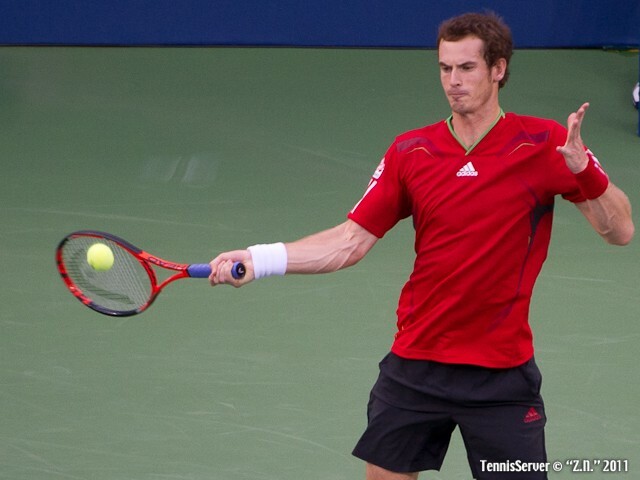 No other slam makes finalists play their most important match the next day. The USTA did it for viewership rewards, which are numerous. 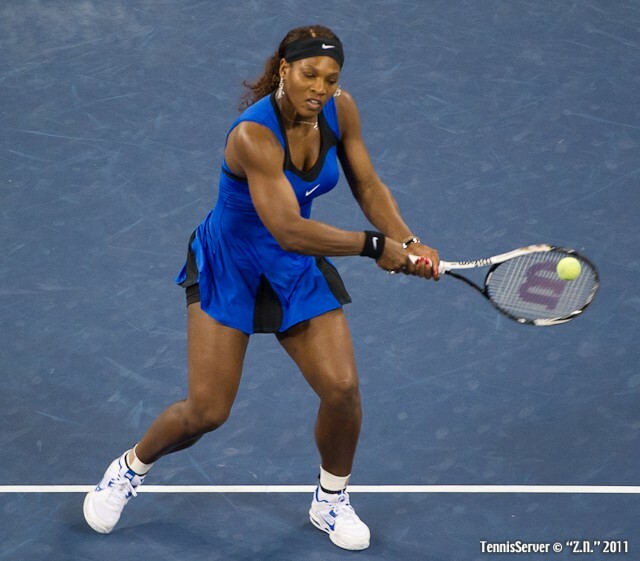 However, the realization comes at the disappointment of Samantha Stosur the #9 seed and to Angelique Kerber, a relatively unknown player but a woman tennis athlete, nonetheless, who has proven herself worthy to be in the 2011 semifinals of a Grand Slam -- one of the four biggest tournaments of the year. "I think my semifinal is at 6 pm on Grandstand," Stosur wrote on her Facebook page. 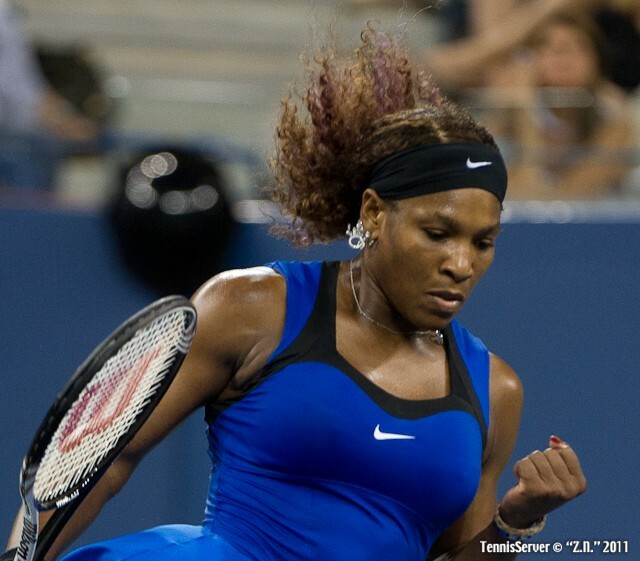 "If anyone wants to watch the only semifinal not on Arthur Ashe, come out tomorrow." The Aussie is a reserved woman with a mighty sense of competition and fair play. And her invitation is authentically sincere, and her message is pointed as well. Those fans -- the lucky 6,000 -- will have the chance of a lifetime to view these two women at a vantage point they'll never experience again. Stosur and Kerber might play a better match, too, out of the spotlight. The fan-friendly environment of Grandstand could draw their best game forward, providing a delightful window of opportunity to fame, fortune and self-satisfaction ... plus, a trip to the Sunday final. The USTA had its chance to make this decision a bit more palpable for fans at home. Executives could have arranged to broadcast the match on television. Contracts have been signed, yes. But lawyers are brilliant at getting around their own maze of constrictions by creating more layers of possibility. There's Tennis Channel, for sure. It's an ideal choice because its broadcasting schedule is flexible, perfectly made for this situation. And what about ESPNClassic? Since that probably isn't on the schedule, viewers can see the match live streaming on the Open's website. Thank goodness so many of us have electronic devices. Novak Djokovic hasn't played one five-set match all year. His tennis has been that good. Coming into today he was 66-2. Across the net was the same man he played in the 2010 semifinal at the Open and the same man who we can credit for one of his two losses this year -- Roger Federer. This was the rubber match for both. 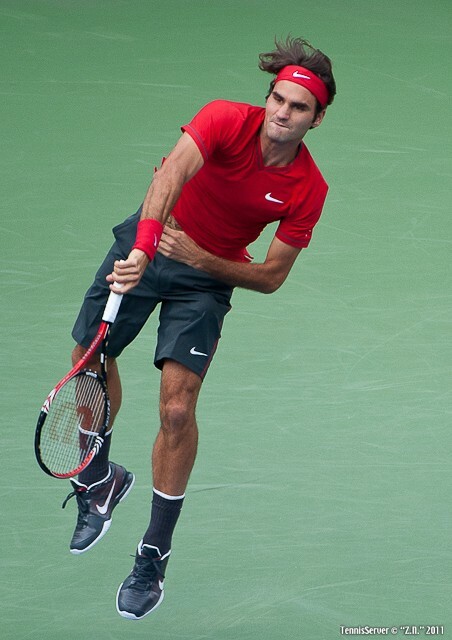 After Roger Federer went up two sets in their semifinal, that's just what faced the #1 player. If he wanted to stake his ground in Monday's final, he'd have to run off three sets. The only consolation was knowing that Federer had lost at Wimbledon, after having been up two sets against Jo-Wilfred Tsonga ... ditto to the same man in Montreal, only Federer was crushed in three. Djokovic started his one-game-at-a-time campaign at love. He put the fear of the Serbian in Federer in the second game, taking it to six deuces and six advantages with even more extraordinary returns of serve and Federer with even more luck on backing him off the advantage. It helped Djokovic that Federer couldn't seem to connect with a first serve. Djokovic broke to lead 2-0. And held to 3-0. Djokovic smacked balls as if they were flies, annoying. Federer was on his heels. 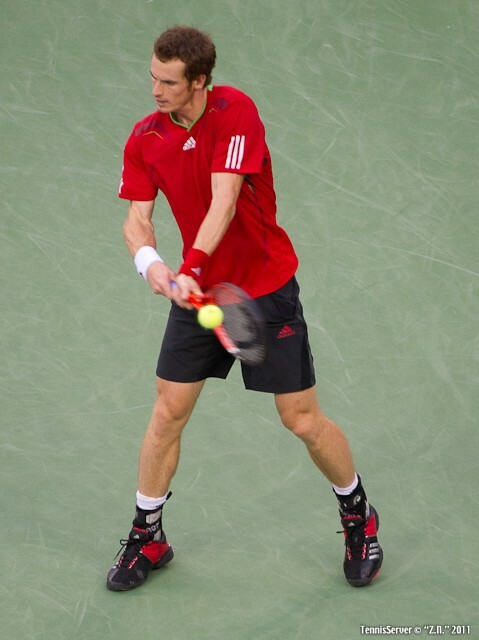 His racquet head speed slowed as did the pace and intention of his shots. Djokovic jumped on those opportunities. He went up 4-1. One break. At 5-3, Novak served for the third set. He had momentum. 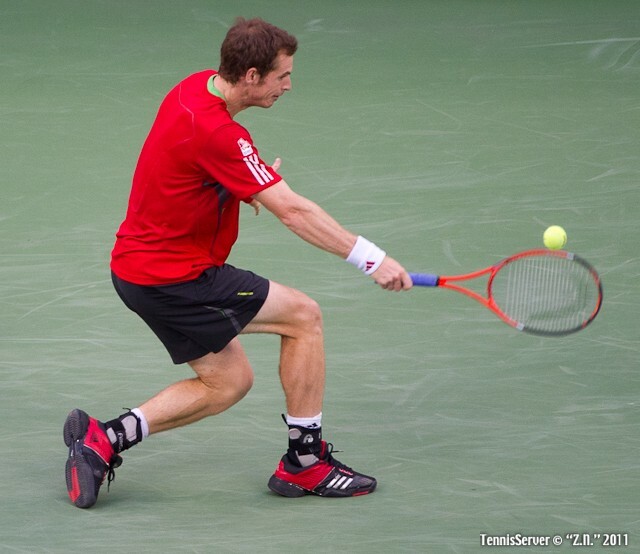 His feet had gained ground, he arrived at balls in time to hit cleaner shots. He continued his offense. It all paid off. The third set was his. He was one third through his campaign. The fourth set was crucial for both men. Start well bodes well. Federer didn't start well. Djokovic ran like the wind, covering miles, or so it seemed, to run down every ball struck. Federer struggled. He couldn't get anything on his shots to put a dent in Djokovic's game. On the defense is not the Swiss man's game. Djokovic was so relaxed he clapped his racquet face after Federer hit a few-and-far-in between winner. Novak's dramatic, mopey-man gestures had vanished. Novak's foot-speed sparkled and his squeaky clean ball striking. He was more dangerous, more offensive. At the same time Federer's big weapon, his first serve, fell through the court. It was at 36%. Novak went up two breaks -- 4-1. 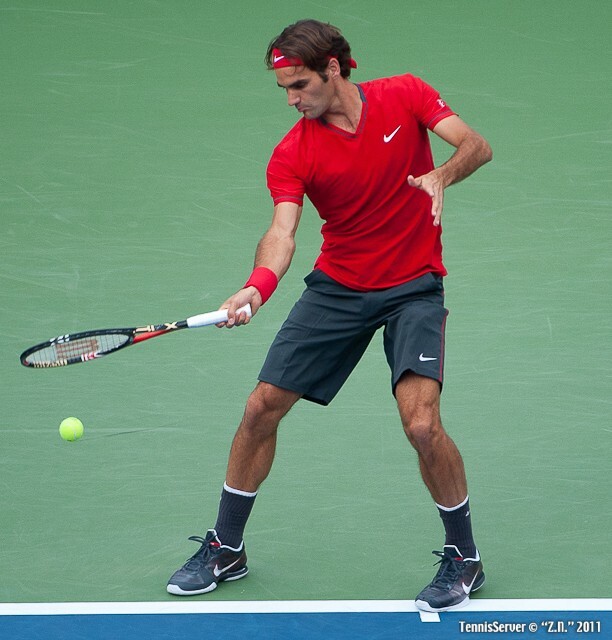 Federer showed signs of a resurgence as Djokovic served for the set at 5-2. 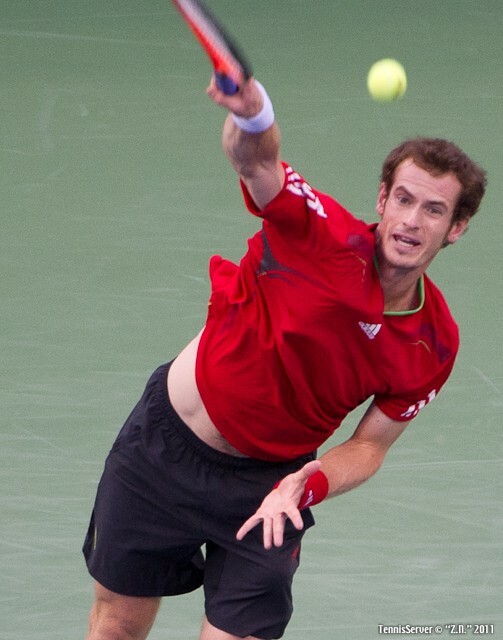 One fierce rally went to the five-time Open champ. He was shifting gears, but didn't cruise. Novak took the fourth. With Djokovic serving at 3/4, the Serbian stumbled outside his zone. 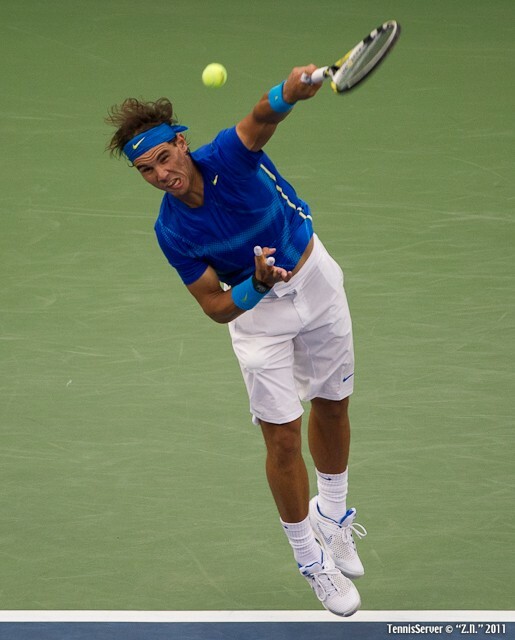 One forehand error and a double fault put him on the brink. 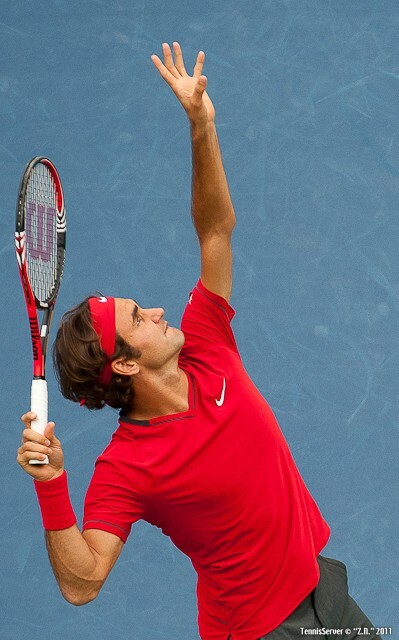 Federer held three break points. He converted. The match was his, if he could win four points. With two match points on his racquet, just like in 2010 only it was on Djokovic's serve, Djokovic slammed a cross-court forehand return of serve. 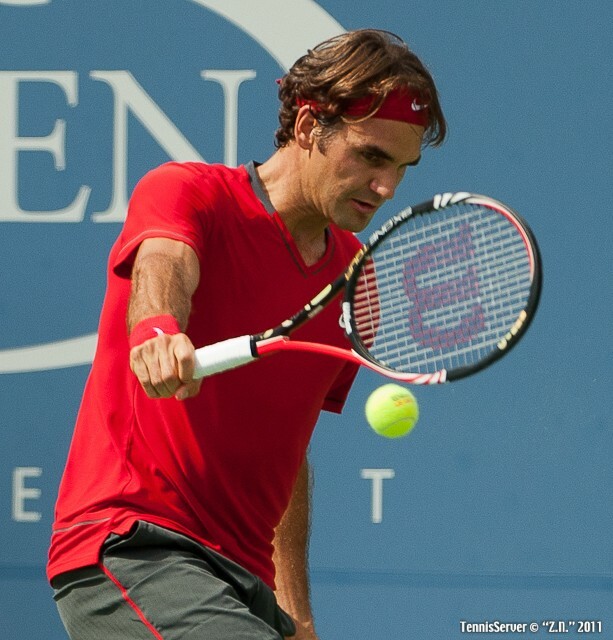 It was an awesome sight, a lucky go-for-broke winner off a decent serve from Federer. Djokovic had swung away with abandon. The net cord helped him win back the last break point. And on his second chance to even the set, Federer double faulted and handed Djokovic the game. Remnants of lost opportunities seemed to infiltrate everything Federer. The punch was flat. His positive posture sagged. 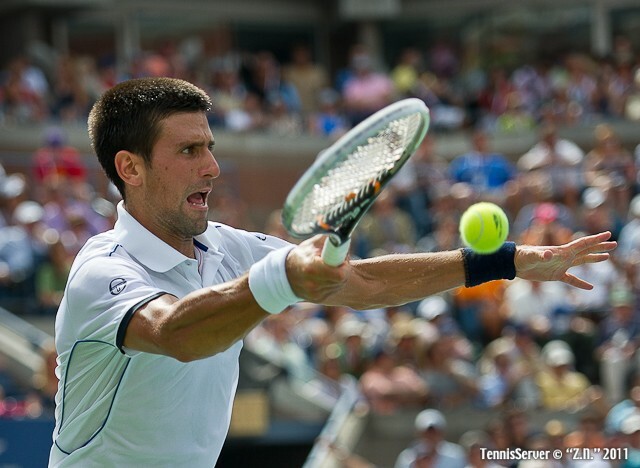 Novak, energized as he should have been, went after it and as would have been expected won the next game. Now with his two match points on his racquet, Djokovic rode his wave of pride and his deja vu comeback to the finish line. He put the match away -- 67(7) 46 63 62 75. He will have his chance at the title, once again. The loss for Federer has to be tough. When he left the stadium, he gave fans the thumbs up, though. He has gone the year without winning a Grand Slam, the first time since 2003. Can he still be considered in the mix? Or, will this hideous hyperbole of recreation sink his spirits to a level not even Roger can recover from? "I'll be extremely hungry going to Australia," Federer told the press, immediately following the semi. But, "It's awkward having to explain this loss because I feel like I should be doing the other press conference." Federer certainly didn't feel Djokovic's cross-court return winner was a result of confidence or hard work, either. He said, "Confidence? Are you kidding me? Please. He was mentally out of it and then he gets lucky and there you go. I set it up all perfect. I just couldn't finish it." The two men who next walked on Arthur Ashe probably shared a similar thought -- they both wished Federer had won. 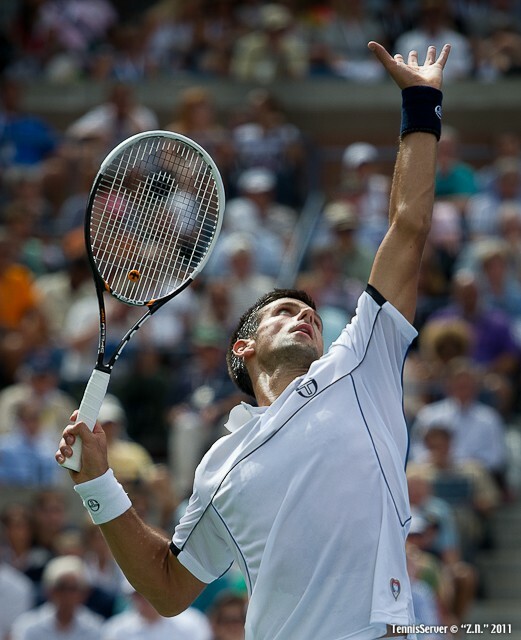 A hungry Novak Djokovic, starving for his third major title of the year, awaited the winner. Since the Djokovic/Federer match consumed close to four hours of time, the USTA's decision to locate Stosur and Kerber on Grandstand put the overweight governing body in a tiny better light. However, the USTA's message remained clear, it still was like telling a football fan ... you can't watch your favorite team's playoff game because we don't have the resources or intellect to make all things available, and fair. Remember this quote after Hurricane Katrina from the President George W. Bush, "You did a heck of a job, Brownie"? The same applies here to the USTA.